There is very little in genealogy that compares to that moment when, for the first time, you see a document on which your own ancestor put pen — or pencil — to paper. A signature, perhaps more than anything else, somehow provides a connection that no other piece of evidence quite equals. Don’t get me wrong: I won’t give back any piece of evidence that crosses my path. I’ll happily “settle” for a marriage or death certificate, a listing in a city directory, an entry in a tax list. But a signature… A signature is something special. We don’t see nearly as many signatures in our research as we might like. In so many instances, the records we rely on are records created about our ancestors, rather than by our ancestors. It’s the census taker’s hand that recorded all those lovely details we depend on in those every-10-years records. It’s the tax collector who prepared the tax list. All too often, what we see in the deed and will books are only the entries by the clerks; the original documents are long gone or, at least, not available to us yet. So a signature… Yes, a signature is something special. And it’s all the more special when it’s a signature you never expected to find. In those notes, cousin Dorothy noted that she had reason to believe that some members of our Robertson family had owned land in Hall County, Texas. But we didn’t have any reason to think that my great grandfather Jasper had ever lived there, and none to believe that his parents Gustavus and Isabella Robertson had either. No reason, that is, until we saw Dorothy’s notes. Now Texas isn’t a federal land grant state. But it did have its own land grant system. So one of the first steps always in Texas research is to run the name you’re interested in through the search page of the land grant database at the Texas General Land Office. “Robertson,” I typed. And chose Hall County from the dropdown list. Hall County. File 029530. Grantee Robertson, G B. Hall County. File 026139. Grantee Robertson, W M.
Hall County. File 036368. Patentee Robertson, G B. So I asked Lynn Parent, a Texas researcher, to get me copies of those files, and two others under the name L.D. Crenshaw (a Robertson son-in-law). And the contents blew me away. It was the signatures. Their own original signatures. And I’d seen Gustavus’ handwriting before as well, on a 1903 letter he’d sent to daughter Mary Isabella. It’s not as strong as Gustavus’ signature. It’s fainter, the letters less crisp. But it is unmistakably an original signature, attested to by Ben H. Kelly, a notary public, who said he was there and watched her sign it. Watched her write the only thing any of her descendants today has ever seen written in her own hand. A signature… Oh yes. A signature is something special. I found a great aunt’s handwriting on a census form. She was the enumerator! Just by chance I noticed her name at the top of the pages. Now I always look to see who was the enumerator, because maybe I’ll find another relative! — and yes, signatures beat out all other forms and documents every time! Now that is really cool to find a family member as the census taker! We also had Jasper’s signature on a couple of Odd Fellows documents, but, not G.B. or Isabella, of course. Another thing limiting the number of signatures we’ll see is the literacy of the ancestor. All too often, it’s “his mark.” So it makes this find all the niftier! I think it’s because we know that they have physically touched and written on the paper that makes it feel so much more emotional than their name, for instance written or typed by a clerk. I have my grandmother’s crochet hook with the last piece of crochet she had started still on it and a few pieces of her work (unfortunately I didn’t get a bedspread), and those, along with the signed names are real treasures. Unfortunately I don’t think my children or grandchildren will ever have the same emotional attachment. I’ve talked about her and shown her handiwork but none of them knew her—and therein lies the rub. I think you’re exactly right, Mary Ann: it’s the fact that their hands touched this paper. But I’m not sure how much the knowing-the-person matters. I mean, I understand that something belonging to my grandmother, whom I knew and loved, will always be more important to me than something belonging to my other grandmother, who died before I was born. But once bitten by the genealogy bug, that document signed in 1892… well, just plain wow. We need to get one of your kids or grandkids bitten!! Well, I’d like to get several people in my family—even my husband! !—bitten but, so far, no luck! Two of my sisters are slightly interested—when I show them things I’ve worked to find. The other one—not. I thought my oldest daughter would be really interested (she and her husband had done some research on his line shortly after their marriage) but she recently commented, without being asked, that I shouldn’t count on her to “take up where I left off.” My middle daughter and my son are capable and well-suited to take up the torch but I just know they won’t. My youngest daughter isn’t ever going to sit still long enough to do it—at least, coming up on 40, she has shown no signs of doing so. The grandkids seem to be mostly interested in their electronic gadgets and the siblings in fighting with each other!! I just keep plodding along, filling out the charts to the extent possible, and trying to get things in orderly files so things can at least be found—if anybody wants to see them! We’ll corral somebody one of these days!!! I’ve seen people laugh out loud, cheer — and even cry buckets — at the National Archives, Janice! I suspect the records room has seen a few genealogy happy dances over the years! I will never forget the first time I actually saw a census record of my great grandfather, Gustavus B. Robertson, and his family on the screen in from of me. I was very new to genealogy research and was in the genealogy section of the Huntsville, Texas, library. I gasped and clapped both hands over my mouth to keep from shouting out. I think I was the only visitor in the library and one of the ladies working there saw me, and came over to me and said, “You know, this is a library but we don’t mind hearing a “whoop” or a “holler” once in a while. We absolutely understand. I’ve gasped — and a whole lot more — the only thing I haven’t done in a library or archives is cry! And I’m also smiling because I was about to say, “Wait a minute, he’s your great great grandfather,” and then I remembered that even though we’re close in age, you’re a generation above me thanks to your Dad being the youngest and waiting so long to marry your Mom! It certainly is exciting to find examples of our ancestors handwriting. If I do not have a photograph, I make a special effort to find a signature. One of the archival sources I indexed was an original petition from the 1870s, with signatures. Descendants of those people may struggle to find handwriting examples from that era, so I listed all the names on my Web site. I intend to index more petitions when I have some spare time. That’s so very kind of you to do that, Judy — nice job of community service! So true! I gasped, wept and danced when I found a petition signed by oodles of relatives. To have my Mulkey, Duncan and Stephenson kin all on one page – it was the best feeling. Oooohhhh. I am now Officially Jealous, in capital letters. Great find, Susan! Yes. With a signature, it’s as if you are almost touching your ancestor’s hand. The hand that was so close to the letters it was forming as the signature was being made. It’s as if the physical distance has collapsed (almost completely), and only time is separating you from the writer. The thrill of being in the courthouse and holding the marriage bonds with my ancestor’s signature and that of his father-in-law (who obviously was my ancestor, too) was almost more than I could stand. They were dated that historical year 1776! It literally is enough to bring tears to your eyes, isn’t it, Kat? Seeing our ancestors’ signatures is such a special thing. Those signatures are the next best thing to seeing a photo of our ancestors. I was ecstatic when I happened to come across the signature of my 4th great-grandfather, who was a surgeon in the Revolutionary War. And the document was dated 1776. 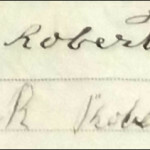 I’ve even dedicated a page on my blog to sharing my ancestors’ signatures. Really great that you have a page for this on your blog, Jana! Great idea. Thanks so much for including my blog posts, Jana!